I especially liked the Kiffy because of the three wheel balanced design and the frontend luggage feature but it was just too pricey. I also liked the banking capability. I have a Dahon folder that's nice for 10 to 20 mile jaunts. It looks so easy, but I can tell you I had a lot of trouble in slight hills. I understood that former President Jimmy Carter and his wife would go riding on these. I had wished I got the motor assist. In truth it does give you an upper body workout. The one that caught my eye here was the half-bike, but I started to remind myself that I'm too old to do without a seat. If anyone has some interesting bike designs or ideas we can share them here. There is a much older article that I couldn't find yet where a researcher modified the bicycle fork in different ways to show how it affected stability. The key takeaway was it wasn't gyroscopic action that kept a bike stable. I recently moved to the foothills near a Regional Park that is extremely hilly, and one of my new neighbors is an accomplished mountain biker who recently converted one of his old MTBs into an electric bike. 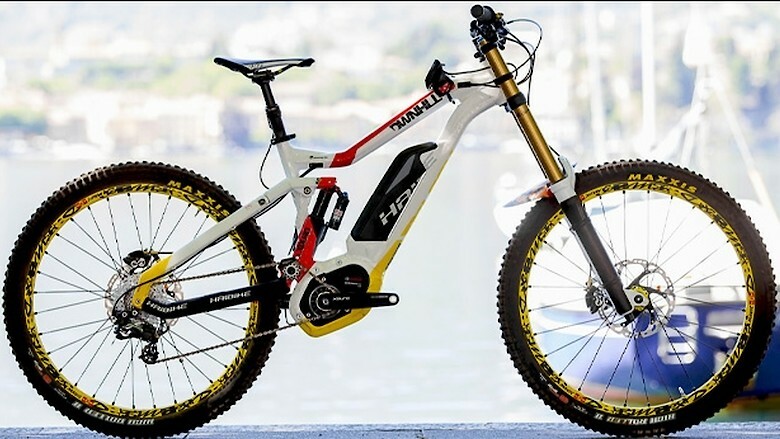 It's pretty flexible in the way that you can freewheel the motor and pedal, or freewheel your pedals and let the motor do all the work, or use a combination of battery power and your leg power. It's pretty powerful, and he uses it to climb some of the steeper hills in the park. It's got enough power that he can lift the front wheel pretty easily and ride wheelies around the neighborhood. Fun stuff. I'm interested in maybe doing a similar conversion (now I wish I'd kept my old MTB instead of giving it away before the move), and maybe using it for commuting to work. My commute is about 25 miles each way, which wouldn't be a big deal on a road bike except for the climb at the end of the day to get up the hill to my house. Having the e-bike option might make it easier to commute more often without using a car (maybe in combination with Light Rail). My neighbor operates a "peddy-cab", peddle cab or rickshaw. He transports passengers, usually to their cars after the bars let out, or after football games. It's his only business and he gets by. I would say that its design is a novelty. It has a seat for passengers and he sits low in front and peddles. So instead of looking for employment from others, one can be self-employed in this way. Post a picture of the pedicab. Sometimes there's interesting modifications made to improve its operability. MIT did some engineering work on a new kind of wheelchair for rural villages. Oh my. Thanks for posting that @jedishrfu -- speaking as someone who has pushed patients in wheelchairs through some pretty knarly situations, those are nice improvements. Here's another list of some novelty bikes. Many are basically art but a few have some novel engineering challenges like the bike on a bike. I don't know how well these things sell but they definitely bring out the DIY maker in me. I was also intrigued by the bike spike which can be used to track your bike wherever it may be. but it looks like its now a defunct product. (www.bikespike.com) However there must be similar ones out there or at least use a Tile to track the bike. In contrast, my shimano derailer is a real pain to adjust on my cheap 7 speed bike. It seems it misses a speed so I ride in one gear and seldom change it up. My bike was the Mariner (I liked dark blue) which is now an 8-speed. The question I always have for exotic designs is, "What is the advantage of a given exotic design over more common designs, and is that advantage worth the extra expense and difficulties in maintenance and repair?" My family has been using basic Trek mountain bikes (Marlin and 3000 series) for the past 15 years, and these work well. Costs are modest, and maintenance and repairs are simple. I mountain bike over 2000 miles a year on local trails. My two sons mountain biked with me in their early teen years, and now their bikes are their main mode of transportation on a large urban college campus. It both helps keep them in good shape and avoids the expenses and parking hassles of cars. As friendly as their campus is to mountain bikes, many of the exotic designs above seem problematic. Some seem to propose safety issues, as being lower to the ground reduces visibility - both the cyclist's visibility and how easy it is for motorists to see the cyclist. Drivers on this bike-friendly campus are very much attuned to "normal" cyclists. Further, the designs with smaller diameter wheels will tend to have problems on some surfaces and negotiating curbs. Wider designs will have problems negotiating narrow pathways and maneuvering around parked cars, pedestrians, skateboarders, and all the other obstacles on campus. A number of the exotic designs above will not quickly fit into the standard campus bike racks, and campus parking and storage is going to be a challenge for exotic bike designs that do not. To me, the most meaningful design improvement is the added electric motor - because these increase speed and practical commuting distance while maintaining the familiar form factor and all the benefits of very mature bike design that is already optimized for most uses. To my eye, most of the exotic bike designs are different and more expensive simply for the sake of being different - most of the performance advantages are nowhere near justifying the extra expenses and practical difficulties using them and keeping them on the road. However, new engineering ideas should not factor those concerns in initially as it can limit the engineering creativity where really innovative designs are dropped before they are fully explored. As impractical as some of these designs are they provide that creative platform and act as the germination for even better ideas. Wow, that ceramic gear train is an amazing piece of engineering! Especially the different "shift channels" available on the rear gearset -- very innovative. Just remember what those Wright Bros. did before airplanes! Eugene,Oregon is a very bike friendly town and I have seen a lot of unusual designs. Last month I saw this go by when I was stopped at a gas station. It is a rolling bar powered by the two rows of people pedaling sitting the outside. The central area had what looked like a bar with a tender there. There was a separate driver at the front. It bigger than the red car! It turns out this is a local business: Pacific Pub Cycle. Seems they do tours of the many brewers in town. Would probably be good for tailgating at Ducks games. Seats p to 14, minimum of 8-10 peddlers needed. Looks like they have a sound system in the overhead too. I seem to recall that they had a whole festival devoted to exotic bikes. Though, that was 10 years ago. hmmmm.... (google google google). Yup! "Exotic Bicycle Designs and Engineering" You must log in or register to reply here.